The DW849 polisher I have used in my shop for about 5 years now was one of the best polishers available at the time. If you had heavy polishing work to do, the DW849 was your best buy. DeWalt has since upgraded this model to address a few design flaws. The DW849 spawned a line of excellent yellow clad polishers. Let's take a look at what made the DW849 such a good polisher. The first impression one gets from the DW849 is one of heft. The motor, metal head, and worm gear make the DW849 a very heavy polisher. Most of the weight is concentrated in the head of the tool near the shaft. Balancing is off a little, as it is with most polishers. Once the disk of polisher makes contact with the work piece the weight and balancing issues go away. Most of the weight of the tool rests on the disk. Gravity makes polishing level surfaces very easy and fluid. The weight of the tool pushed the disk into the work piece for you. Vertical surface, on the other hand, require a fair amount of strength from the user. At 8 1/4lbs the DW849 is not the best tool for prolonged vertical or overhead work. The worm gear in the head of the polisher is the centerpiece of the tool. It has been built with durability in mind. Combined with the excellent motor the worm gear allows the DW849 to be used continuously. My tool has seen its share of half day polishing sessions. DeWalt has done an excellent job creating a tool for truly large jobs. The side handle of the polisher is removable. It screws in place on either side. Once installed the handle connects to the tool without any play whatsoever. During operation it allows for steady control of the polisher. A large rubber block at the top of the tool acts as a tool rest when a disk is installed. The tool rests securely on this block upside down with the disk pointing straight up. This position makes it very convenient to apply buffing compound to to the disk without having to touch the disk or any part of the tool. DeWalt has carried forward the rubber block to most of their polishers. The pistol trigger on the handle turns the tool on and off. The motor comes alive gradually to make the tool more controllable during startup. A soft-starting motor is truly essential for polishers. The trigger can be locked into place with a trigger-lock button. On the DW849 this button is small and hard to reach. 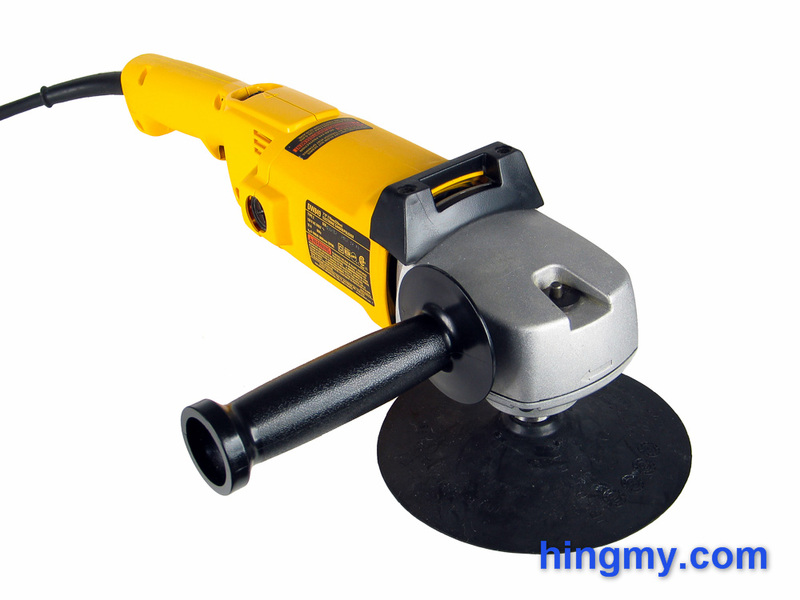 In newer versions of the polisher the button is larger and easier to press. 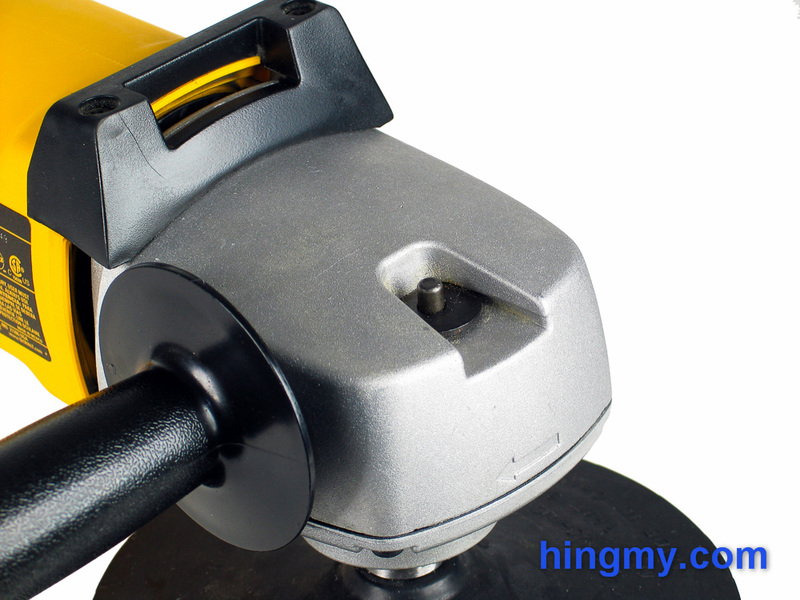 The speed of the polisher is adjusted with a wheel at the top of the tool. The wheel has 17 unique settings between 1,000 and 3,000rpm. Once set the trigger brings the tool up to the selected speed. The DW849 has a built in spindle lock for changing disks. A small, spring-loaded metal pin at the front of the tool locks the arbor in place. It's small enough to be annoying and somewhat painful to press. The mechanism is made completely from metal, which ensures a long service life. If you need to install a very large or cumbersome disk, the arbor is milled flat below the threads to accept a wrench. A disk can be installed the old-fashioned way with two wrenches. The Spindle lock makes disk changes easy. Engage the lock, remove the old disk, install the new one, and spin up the polisher to let the disk seat itself securely. The DW849 comes to life with a mighty roar. The worm gear gives the tool a distinctive sound. Once the disk is up to speed the polisher goes about its work with unrelenting force. It is so powerful that I was never able to slow it down at any speed. The DW849 will spin its disk no matter what. As a result any work you ask of the tool is completed very fast. The large disk, raw power of the motor, and high weight of the tool work together to put this polisher at the top of the performance charts. Few tools will outperform the DW849. Handling, however, is a different story. Being a large tool, the DW849 wants to be used like one. It resists direction changes and does not like to go into corners. If you are not careful it'll use all the power it has to get away from you. That's the price to pay for having all that performance at your fingertips. 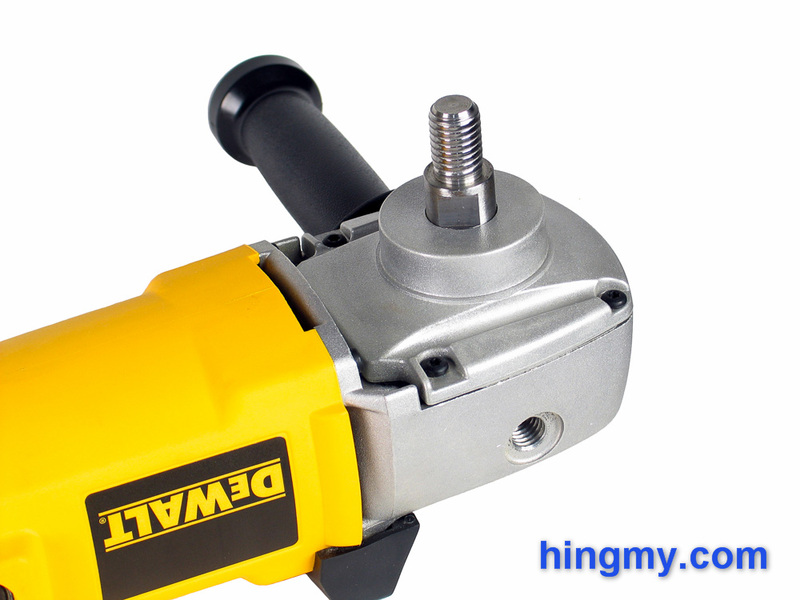 The motor ejects a lot of air towards the head of the tool. This is presumably done to cool the head and the worm gear contained within. The extra airflow makes the tool even louder than it already is. The blast is so strong that it can blow away polishing aggregate near the disk. If you regularly use dry polishing compound, the DW849 might not be the best tool for you. The DWP849 is the current version of the DW849. The trigger and spindle lock issues of the DW849 have been taken care of. The new tools is lighter, but remains a DW849 at heart. The DWP849 has the same level of power the older model does. The DWP849X adds a larger grip to the package. The U-shaped grip is a much-requested feature in the automotive world. A few years back the DW849 was one of the best heavy duty polishers available. Never lacking in power there were few polishers that could work as fast as the DW849. The model is out of production today, but a few retailers still carry it. If you can get one used, you'll get a lot good use out of it. The DW849 was the start of an excellent line of DeWalt polishers. The newer version, the DWP849, is a better version of its predecessor. Many of the small issues of the DW849 have been addressed in the DWP849. Much has changed in the 5 years since I started using the DW849. 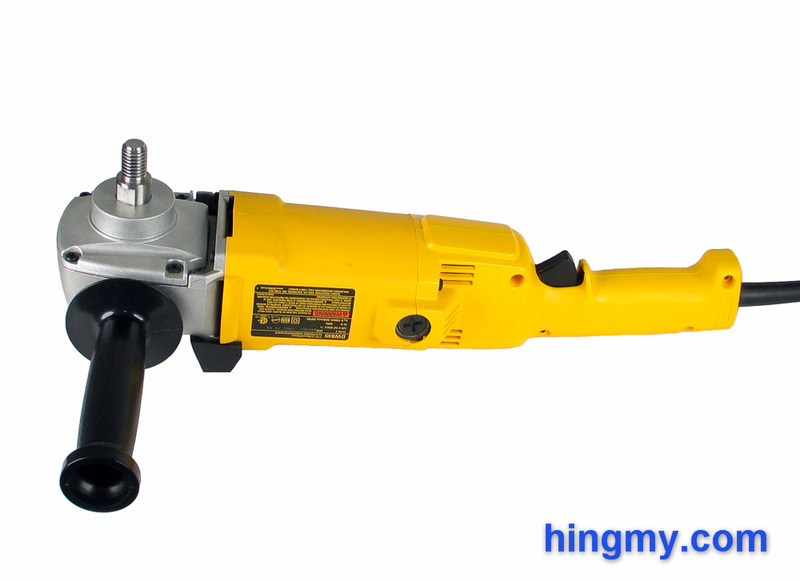 DeWalt large-size polisher, however, remain to be a top choice in this segment of the market. These tools will not disappoint you.